Apple and strawberry quinoa porridge | Gluten free, dairy free, sugar free. Apple and strawberry quinoa porridge | Gluten free, dairy free, refined sugar free. 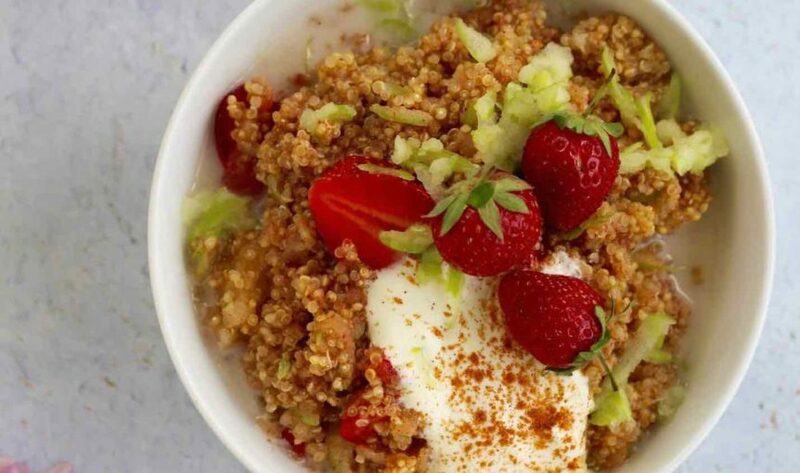 This apple and strawberry quinoa porridge recipe is gluten free, dairy free, refined and refined sugar-free. We have a feeling you will LOVE it! It’s such an easy peasy but kinda special recipe. This recipe is a little sneak peek from one of the app bundle recipes. Did you know we have bundles you can unlock on the Get Merry App? Maybe you didn’t even know we had an app! The app is filled with our BEST recipes from this blog. When you download it you’ll automatically have access to 300 plus recipes with close to 100 of those recipes exclusive to the app. Meaning, you can not find them on this website. Ok, back to the apple and strawberry quinoa porridge. If you’re not eating oats quinoa makes a perfect porridge replacement. Filling, high in protein and all kinds of tasty. Make the recipe and let us know what you think! P.s download the Get Merry app today. Find it on Android and iPhone! Rinse the quinoa under cold running water until water runs clear. Add the milk to a saucepan, bring to the boil then add the quinoa and cinnamon Cover and lower the heat to simmer for 15 minutes or until the milk is absorbed. Once cooked, stir through the strawberries and apple. serve warm with milk and yoghurt or chill in the fridge then enjoy. The perfect recipe to make the night before. Reheat in the morning or enjoy cold.